Bees, hexagons and honeycombs are adorable for any occasion, but especially so when you want to stitch a sweet message for someone you love. 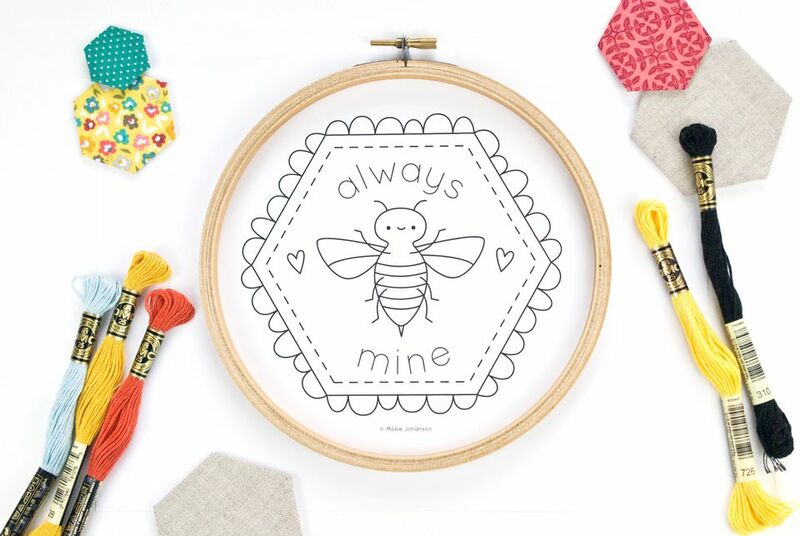 This free Always Bee Mine Bee embroidery pattern is perfect for Valentine's Day and beyond. If you want to make a project that's suitable for any day of the year, replace the words to form your own bee pun, such as "always bee kind" or "bee brave". If you'd rather, remove the hearts and lettering all together to make this a simple bee in a scalloped honeycomb frame. This pattern uses six basic stitches that everyone should know, but you can always use more or less. If you're a beginner, use the stitches you're most comfortable with and if you want to make this more advanced, consider adding fill more stitching to the bee or the scalloped honeycomb border. Frame your embroidery in a hoop for your honey or stitch a kitchen towel for your sweetie. You could also embroider this little honeybee design on a pillow or a tote bag for a child. Grab your favorite embroidery supplies and you'll "bee" stitching in no time! The Always Bee Mine design is a free downloadable JPG. Download the pattern file and print it at whatever size you choose. When you print the pattern to fit a standard size piece of paper it will fit within an 8-inch embroidery hoop. Print the pattern on water-soluble stabilizer or use your favorite pattern marking technique. Again, if you want to make this an everyday bee design, simply skip transferring or stitching the words and hearts. Choose a sturdy evenweave fabric for embroidery or add a layer of stabilizer to the back of thinner fabrics before stitching. Place your fabric securely in an embroidery hoop and begin stitching. Note: This pattern may be used for both personal and small business use, in small quantities. The colors and stitches listed below are simply a way to get you started. Feel free to chose a different color palette (or work the entire design in redwork) and use your favorite stitches. Suggested colors for the Always Bee Mine pattern are DMC 310, 726, 728, 350 and 828. If you prefer to use another brand of embroidery floss, color conversion charts are helpful. Use the image above as a reference for color placement. Embroider the inside of the hexagon with running stitch. Stitch the scalloped border, the bee's limbs and the letters with back stitch. Use two strands of embroidery floss to work all of this. Use four strands of floss for the rest of the stitching. Embroider the hearts with satin stitch. Use stem stitch for the solid line on the hexagon frame and the bee's body, antennae and wings. Stitch the eyes with French knots and the mouth with a softly curved fly stitch.